When someone needs a master of a specific trade, such as mechanical insulation, an expert is called. This expert is expected to know everything there is to know about the craft and be technically competent in installation and maintenance. But for a contractor today, being the expert is not enough. Contractors now need to be not only the expert at their specific craft, but also top-notch business development professionals building strong relationships upfront, assisting potential clients with design and specifications. Contractors need to be business savvy and understand how to manage the financials of their organizations, analyze market segments and trends, and conduct strategic planning. A deep understanding of information technology is needed to most competitively utilize applications such as project management software and 3-D modeling. An understanding of contract law is necessary to review increasingly complicated contracts and protect the organization. There is also LEED, Minority Business Enterprise (MBE), surety, Public-Private Partnership (PPP), human resources, and a myriad of other things to be competent in. Being the master of a specific trade is not enough any longer. Although these topics may not have an effect on every contractor, they are certainly going to create a different contracting environment. Combine this with the economic forecasts for construction, and a new skill set will be needed to manage a successful contracting company in the future. Two of the hottest topics for the future of contracting are business development and productivity. When economic times were robust, contractors could pick and choose whom they worked for. A daily glance at the fax machine or a morning review of voicemail and e-mail might be enough to bring in more business than the company could handle. With a lack of competition, margins began to rise to a point that projects had enough “fluff” built in to cover any inefficiencies in the operations. Those days are no longer, and with the market not forecasted to return to 2007 levels until at least 2014, it will be a long time before the market dynamics of 2007 are seen again. The trend for a greater emphasis on business development has been driven by increased competition, commoditization around price, and a decreasing backlog. Relationships that were built over a number of years have been tested. Clients that traditionally negotiated work are now taking advantage of the climate and putting work out to bid. The overall trend is that contractors do not have enough work, and there is an ever-increasing need for a business development strategy. For contractors of the future, business development strategies will need to be robust, with the appropriate level of resources involved. Every person in the organization will take a role. The need to train the field supervision and project management staff on how to maintain relationships and seek out opportunities with current clients will increase. Business development strategies will need to include fact-based market research rather than assumptions, rumors, and “gut” feelings. A thorough understanding of the market dynamics, customer buying preferences, customers’ level of satisfaction, competitive landscape, forecasts, funding, and drivers of local economies will become part of the business development strategy. The use of social networking in business development efforts will be another trend for contractors in the future. Every organization will need to evaluate what role applications such as Twitter, LinkedIn, and Facebook will play in its business development strategy. Finally, the future contractor will need to measure and evaluate business development efforts. With limited resources available, contractors need to ensure that efforts to capture business are maximized and the return on the investment is positive. These business development metrics will be closely tied to estimating, and measurements such as proposals, new customers, level of interaction, and hit rates in association with current clients and past clients will be evaluated. Contracting going forward will be different than in the past. To be an effective and profitable part of this future, contractors must re-evaluate their business development strategy and rethink the way they go to market. 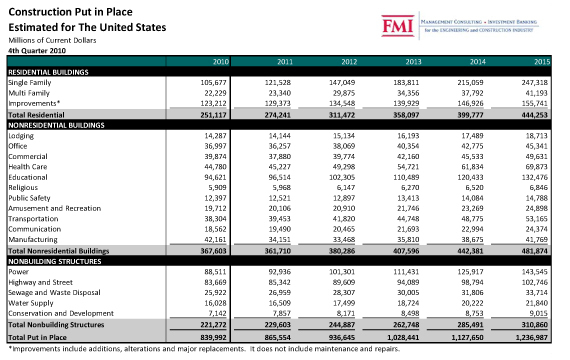 Productivity was the second hottest trend for the future of contracting mentioned in FMI’s 2011 U.S. Markets Construction Overview. The emphasis for contractors going forward will be producing flawless work and utilizing lean principles. With the competitive nature of the bidding environment and the clients’ expectations, there is no room for “fluff” in a bid to cover inefficiencies. Contractors must look at all their internal processes from pre-project planning to estimating feedback to ensure they are operating as efficiently as possible. This is not an easy task with project team members now wearing multiple hats due to staff reduction. Superintendents are taking on more projects, bigger field staffs, and riskier subcontractors. Project managers are being used in business development and estimating. These added duties have created an environment of firefighting, where efforts are expended on the biggest problem at the moment. Project teams will need to be more proactive. With margins squeezed to the extreme, the planning and operational efficiencies that “we were too busy” to address in the past will be a necessity. Projects with little margin have no room for margin erosion, and the project team needs to plan better than ever before, create strategic ways to build projects, and overanalyze every cost. Project teams should focus on margin-enhancing opportunities rather than efforts to stop the bleeding. Eliminate wasted time, material, equipment utilization, and effort. Reduce costs while improving quality and customer satisfaction. Create a continuous improvement culture from the top down. Slower economic times demand flawless execution on construction projects. Project risk will continue to increase, and contractors will continue to operate with fewer overhead personnel. The requirement for contractors in the future will be to identify all opportunities for improvement from the office to the field and execute flawlessly. While business development and productivity topped the list of topics affecting the construction industry’s future, the remaining 10 items are just as important and will shape the landscape in which contractors operate. The world many contractors were brought up in does not exist any longer, and those who want to be successful must change and adapt. For contractors of the future, being experts in the trade is not good enough. FMI believes we are now bouncing along the bottom of the recession for the construction market and that the climb back out will be slow. The end result will not look like it once did. When thinking long-term about an organization, one important aspect to consider is market trends. Contractors will need to be more versed in and have a deeper understanding of the market trends in their specific areas. 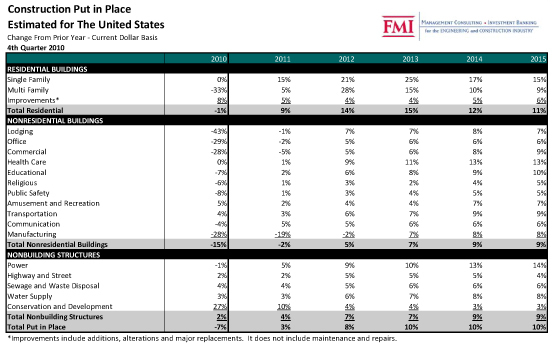 As part of the 2011 U.S. Markets Construction Overview, FMI analyzed macro-economic trends for the construction industry. The current lag is believed to be caused by the expenditure of the stimulus package and the lack of private sector money to replace it. FMI’s Construction Put In Place Forecast breaks down forecasted spending in several sectors and presents the year-over-year change. While 2011 will be down overall for nonresidential construction, pockets of activity will be positive. Nonbuilding structures will start the slow climb next year, along with the residential market. In addition, local demographics will have some areas countering the national trend. Of note for mechanical insulation companies is the growth expected in power and the decline expected in manufacturing. The growth in power is driven by environmental regulation and transmission and distribution projects. There is a lot of talk about an increase in nuclear activity; however, it is not expected to fuel growth in the power segment until after 2015. The manufacturing segment has slowed after 6 years of strong growth. Growth in the future, however, will not be from textiles and automotive, but from refinery projects, battery manufacturing, and electronic manufacturing. Several other pockets of optimism can be found, but an in-depth look at trends in a contractor’s area, along with the drivers of those trends, should be analyzed for planning purposes. The economy and the trends in the contracting industry are changing the way business is done. Contractors must be much more than experts in their fields, and this often requires outside assistance. This environment of change and adaptability, along with the need for outside help, is testing the limits of some organizations. To be successful in the future, contractors will need to reinvent themselves and adjust to the new trends and expectations. For a contractor of the future, being an expert at the craft is not enough. Construction Put in Place, Estimated for the U.S.